I was surprised and impressed on many levels walking through the Panjiva Trade Intelligence Platform with founder Josh Green. I had written an earlier piece about Panjiva a couple months ago entitled “Bridging the Continental Divides Between Buyers and Sellers?” so I knew that the key folks had come from the crème de la crème of academia – Harvard, MIT, Dartmouth- and had been successful apprehending both angel and equity investments. So I knew they were all smart and well endowed. Don’t you just hate that! Word on the streets was generally positive. A cursory review of their website, promotional material and social media updates leave a good impression. You can tell they are on the ball and “have their stuff together” as a company. Notably, Panjiva was/is the only top tier TI provider that focuses on one singular market segment and business application, i.e. sourcing. PIERS has a handful of products: Prospects & StatsPlus (which they acquired from CenTradeX last year) as well as MyPiers, iPiers, Piers TI and Piers Trade Finance which tend to be geared toward particular market strata. Prospects, as the name implies, is primarily a prospecting tool. Datamyne, Zepol and Import Genius sell all-purpose applications, trying the “one size fits all” approach. Panjiva focuses on sourcing, period. Their website is designed around telling that story. Two prominent navigational tabs point prospects to either “For Buyers” (those sourcing) or “For Sellers” (those who want to be sourced). Their pitch to buyers (importers) is elaborate and convincing. In accordance with Panjiva’s business objective and market niche in the sourcing world, they have apprehended over a dozen third party data sources that they connect (with various degrees of success) to the daily U.S. Customs data feeds. I admit, after going through their interface and digging into the details behind the scenes, I have become convinced that Panjiva has- by far and away- the very best trade intelligence product on the market today for certain types of U.S. importers (those who are sourcing products and components being shipped via waterborne transport from factories overseas, i.e. non NAFTA countries). Obviously, that was their clear and defined business objective and that is what they have accomplished, for which they deserve kudos, and because of which they will most certainly garner increasing market share. In several subsequent articles, I’ll “go under the hood” to examine the particulars that developed the above perspective. 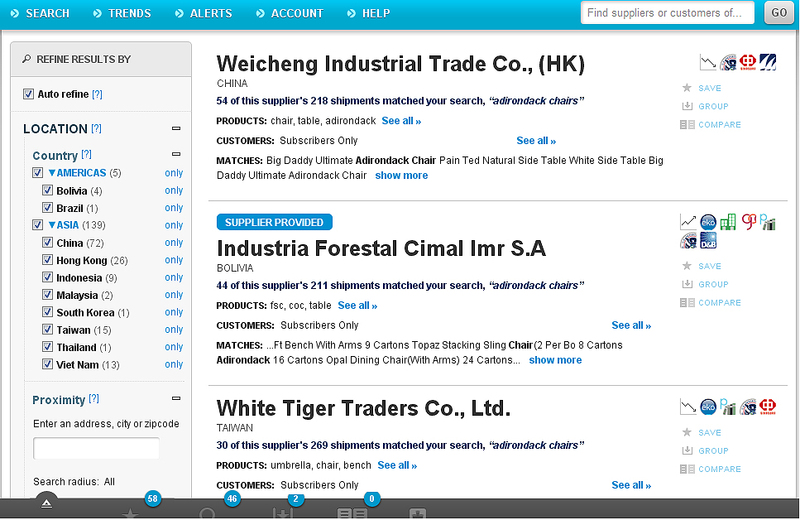 Sample of Panjiva Search Screen. It all starts with the right question.